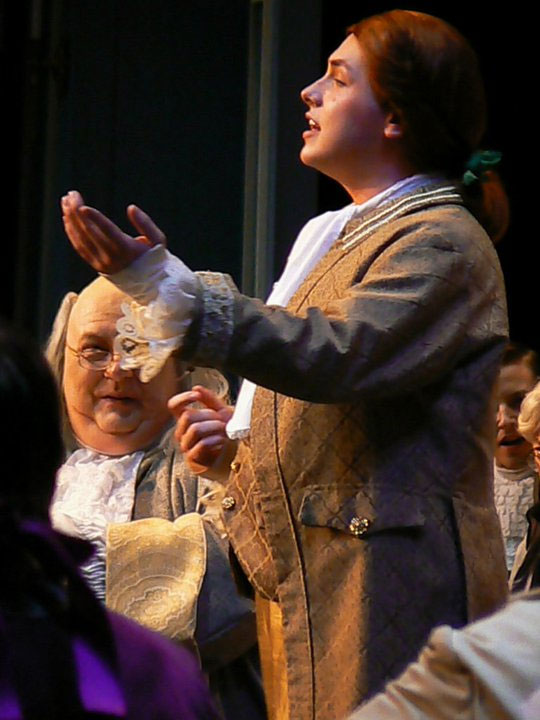 New musical theatre work, revised version since the 2011 premiere, this is the story of the 1787 Constitutional Convention, beginning with Shays Rebellion through Ratification. Only 11 years after declaring independence from England, Americans are fighting because the Articles of Confederation have supplanted one failed system with another. James Madison and others convene in Philadelphia to resolve escalating conflicts. With urgency to save the country, George Washington presides as the other delegates – at times sneaky, savvy, silly, saucy, or stubborn – eventually make compromises which leave many of them with limited satisfaction. When Madison intimates his sense of failure to Ben Franklin, Franklin avers the wisdom underlying what they have accomplished. States struggle to ratify the new Constitution, and citizens proudly proclaim their strong identity as Americans. ACT 1 In January, 1787, Massachusetts farmer Daniel Shays and reluctant tax-collector Jason Parmenter lead over-taxed farmers in a tragic rebellion – a direct result of government failures. In response to such uprisings and unending disputes among states, James Madison and other representatives prepare to meet again in Philadelphia to revise – or replace – the inadequate Articles of Confederation. Delegates convene, prepared to protect their individual nation-states’ interests, and they argue vehemently about urgent and compelling issues including rights of the people and those of the states, rights of large states balancing those of small states, threats of takeover by foreign countries or alliances with them, and problems of trade, commerce, and Indians. The rancor is suspended temporarily when George Washington, revered by all, accepts the Chair. 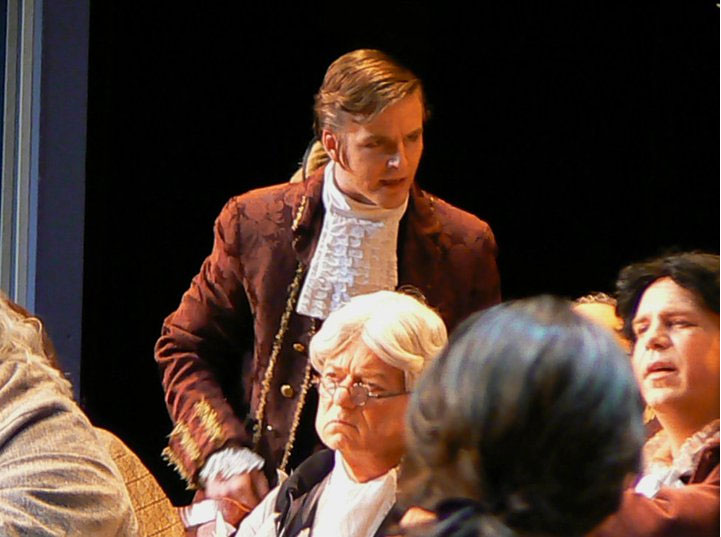 Though directed to keep their discussions secret, delegates carry their work into the Indian Queen Tavern in the evening, where manipulative shenanigans of delegates are planned and continue to be played. Several issues and proposals arise before the “future” Hamiltons, Madisons, and Washington take a look at what will happen someday, bringing Act 1 to a close. 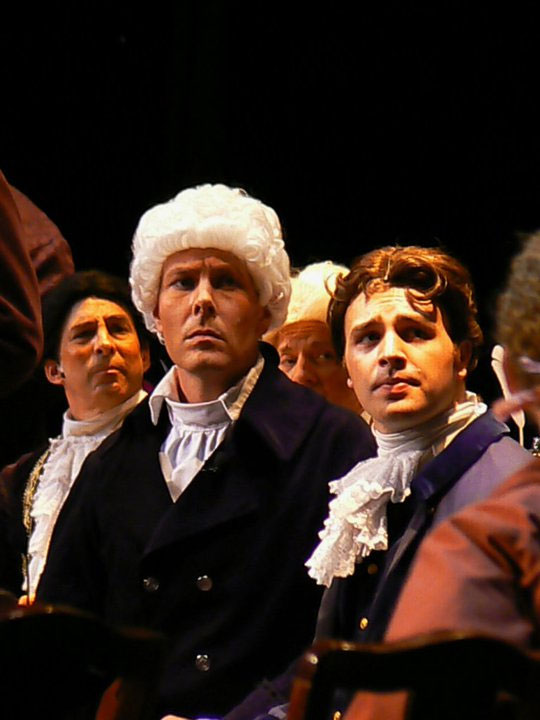 ACT 2 Frustrated with the proceedings, Alexander Hamilton has departed the Convention to visit his wife in New York, but he is torn, compelled to be in both places. Meanwhile, delegates continue to debate at Independence Hall, and though compromises address most of the issues, many delegates are left with limited satisfaction. Listening in on the slavery compromise benefiting the Southern states, Washington’s slave, Jackson, sings in soliloquy, recounting his wretched life and losses, and suggesting a “…bloody silence and a bad, bad vi’lence…” coming as a result of continued enslavement. Latecomer John Langdon, having missed most of the proceedings, then arrives to represent New Hampshire, which prompts an upbeat recounting of all that has transpired. Returning to the Convention, Hamilton rejoins the effort. As the summer ends, some delegates re-visit their individual frustrations and refuse to sign the Constitution, but when it seems that all may fail, Franklin offers a solution. Representatives present the Constitution to their states and report challenges of ratification, building toward the finale, a patriotic celebration for Americans then and now.